It’s amazing how quickly things can change in the footy world. Earlier this year West Coast midfielder Dom Sheed was struggling to bed down his spot in the club’s best 22. After playing the first six fixtures of the home and away campaign, the inside bull was omitted from the side ahead of its derby clash with Fremantle. 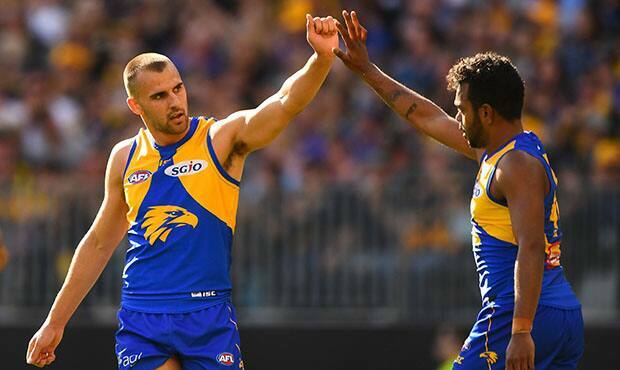 He worked his way back into the match committee’s good books for the Eagles’ round 10 encounter with the Hawks and played two more games before being sent back to East Perth to rediscover his touch after a quiet showing against North Melbourne in Hobart. Sheed proved he was a class above in the WAFL with a best-on-ground performance against Peel that boasted 34 disposals, four marks, three tackles and a goal at Bendigo Bank Stadium. But his place in blue and gold was still uncertain until he got another senior call up after fellow onballer Andrew Gaff was suspended following his round 20 incident with Fremantle’s Andrew Brayshaw. While Sheed would have preferred to reclaim his spot in the team under different circumstances, he has certainly seized the moment, averaging 27.5 disposals a game since returning against Port Adelaide in round 21. He also produced his best ever finals performance last Saturday night by amassing 27 disposals, seven clearances, six inside 50s, five marks and a clutch goal from the boundary on his non-preferred right boot against Collingwood. Sheed said he hoped to continue his good form and help West Coast qualify for its seventh AFL Grand Final. “I’m happy I’m back in and in unfortunate circumstances obviously, but happy I’m back in and playing my role for the team at the pointy end of the season,” Sheed told The West Australian. “I think I’m just playing off more confidence and more instinct now. “I probably wasn’t doing that midway through the year.